The Legend of Tarzan is the latest rendition of Edgar Rice Burroughs’ famous novels from the early 1900s. The film takes a unique approach in that it follows Tarzan - who now goes by the name John Clayton III - after his time in the jungle. Though the audience sees flashbacks of his previous life, the movie begins with Tarzan’s life in England with his wife, Jane. However, he is quickly drawn back to Africa upon learning of the atrocities being committed there by King Leopold. In the King’s search for diamonds, slavery and mass murder are beginning to spread throughout the Congo. Accompanied by his wife and friend George Washington Williams, Tarzan soon learns of an old enemy that wants revenge. If you’re like me, and your extent of knowledge on the Tarzan story was the 1999 Disney animation, the differences might throw you for a bit of a loop. Tarzan’s real name, for example, confused me for a majority of the movie. In the animation, the antagonist is known as Clayton, so I was baffled by why they would use the same name for Tarzan. However, it turns out that John Clayton was Tarzan’s “human” name in the original story. Additionally, the animation diverges from the original story in how Tarzan’s parents die. Instead of a leopard attack, it was actually illness that killed Tarzan’s mother, and gorillas that killed Tarzan’s father. 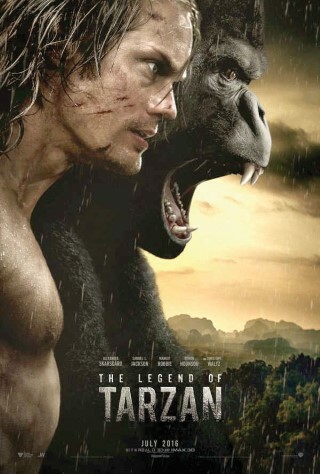 So kudos to The Legend of Tarzan for attempting to follow the original story! Alexander Skarsgård and Margtoo stuck in his element. Always one to play the debonair villain, it was a little disappointing to see him play the same cookie-cutter character. The only real quarrel I have with this film is its likeness to The Jungle Book. Both movies focus on a feral human who attempts to save their native homeland, but they also appeal to difference audiences. I had been hoping that Tarzan would try to emphasize this difference, but more often than not, I found myself a little struck by the cheesiness. The fact that Tarzan could essentially talk to animals - not just gorillas, but all the animals in general - felt like something straight out of a child’s book. I know it’s a fictitious story, and that realism likely wasn’t the main priority, but some things just felt too disingenuous. But altogether, The Legend of Tarzan wasn’t a bad flick. It had an adequate plot, enough action to keep it flowing, and fair acting. I’d definitely advise it to anyone looking for an engaging summer film.